Guys, do you like this outfit? In going on a date and I want to wear this outfit: black shorts, black socks, black sheer button shirt under a buttoned up black cardigan and black shoes. Is this weird looking? Would you judge me for wearing this on a second date? Should a girl wear a crop top if she has a chubby belly bulging over her jeans? Is saying "all bodies are beautiful" objectively dumb, and sending a wrong message about obesity? Do you ever feel ugly and unattractive? Do You Think Plastic Surgery Would Make You Happier? Is there a tattoo you regret getting? I like the high socks and the shoes though. Like I said, it's a good outfit, I would just go with brighter colors, but as long as you like it, you're ok, wear something that represents who you are, that's the best way to dress for a date. I would consider something else, to be honest. It doesn't have to be overly fancy, just something that you are comfortable in and look nice. I like my dates to be casual unless we decide otherwise, it's more comfortable. I actually like the outfit, the only thing I would say though is go with a skirt instead of shorts to make it more girly. That does not look like a dating outfit. And it even looks kind of boyish. 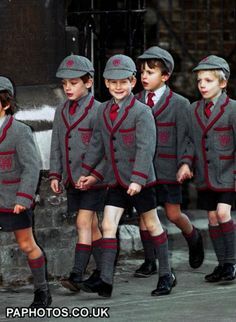 It could just be that the picture isn't the best quality, but the first thing I thought of was a boy's private school uniform. I think it's a great ensemble for a concert, but if you switched the shorts for a skirt of the same length, the outfit would look totally different! Typically women will go for something girly and frilly or some type of dress, but this outfit looks fun and cool. And it's very important that you feel comfortable and that YOU like what you're wearing. By the way, what kind of shoes are those? Where did you get them? P. S. I love the all-black idea! The shoes are commonly known as "creeper shoes" or "platforms". I bought them at Forever 21. Home > Fashion & Beauty > Guys, do you like this outfit?